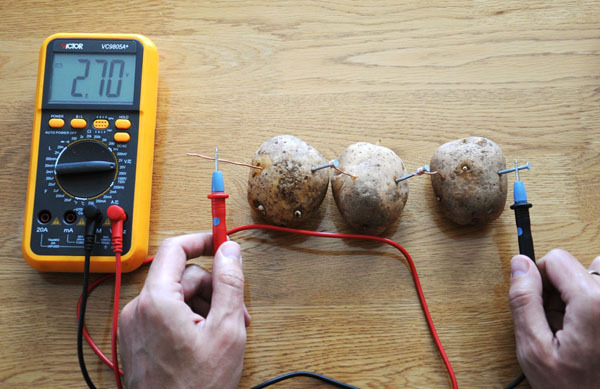 Potato battery science project is a simple experiment which demonstrates how a pair of different metals and electrolyte can produce electric current. It's fun and safe. It can be done in various forms for different grades. If you add some other things to the list, you'll be able to make series of interesting experiments. Low voltage calculator and/or digital clock, lemons and/or other fruits, 3 plastic cups, fresh water, salty water, water with some vinegar, iron wire or nails, aluminium wire or foil. Take 3 potatoes and stick a galvanised nail to one side of each, and copper wire into another side. Connect wire from first potato to the nail of second potato and wire from secant potato to the nail on third potato. Svitch multimeter to voltage reading and make sure that the scale set to read 0-10 volt range. This is pretty much it. Now you can start measuring voltage of your brand new potato battery. 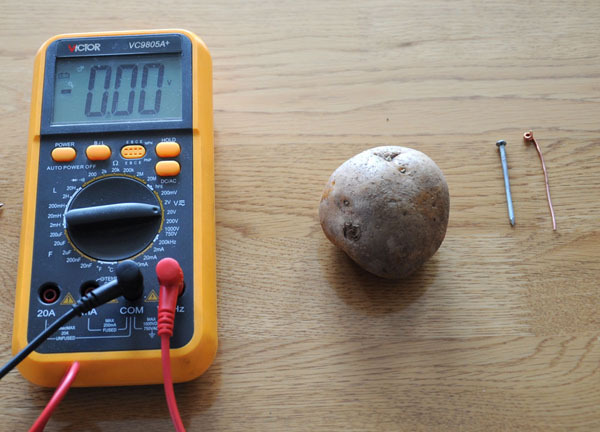 First attach your multimeter clips to the wire and nail on one potato - you should see a voltage somewhere between 0.9 - 1.1 volt - this is typical for a single sync-copper potato energy cell. Note that value may be positive (0.9V) or negative (-0.9V). This is because we have DC type of current here unlike current in the typical wall outlet which is AC. 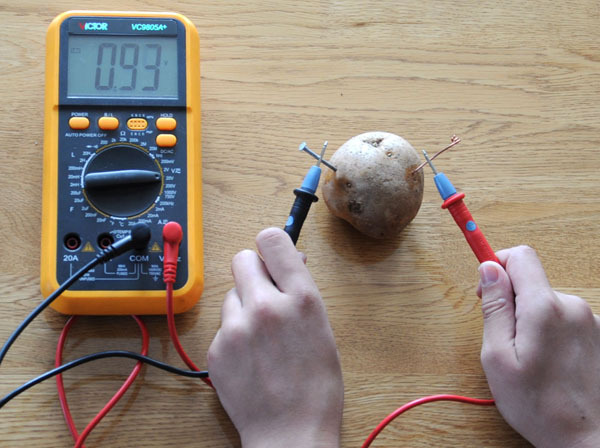 Now try to measure combined voltage from all three potato batteries. If everything is connected correctly you'll get slightly less or more 3 volts. The amperage of this current is very low and not enough to light a typical low volt light bulb. However it could be enough to power up a calculator or digital clock which need very small amount of energy to run. Try to connect nail and wires from the potato battery and power terminals of this devices and see if that will work. Remember that potato battery just like usual battery has positive and negative polarity. Can we try to change voltage of the same pair of metals? What happens if you stick nail and wire very close to each other in potato or as far away as possible? 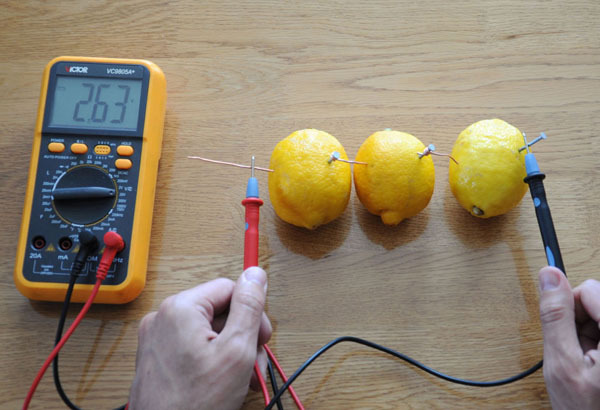 Will voltage be different if you will use lemon, lime, apple, some other fruits? Use plastic cup and fresh water. Put wire and nail in them. Can you see any current? What if the water will be slightly salty? Now try saturated salt solution. What happens if we change the metal pair? For example instead of zynk nail use iron? Aluminium? 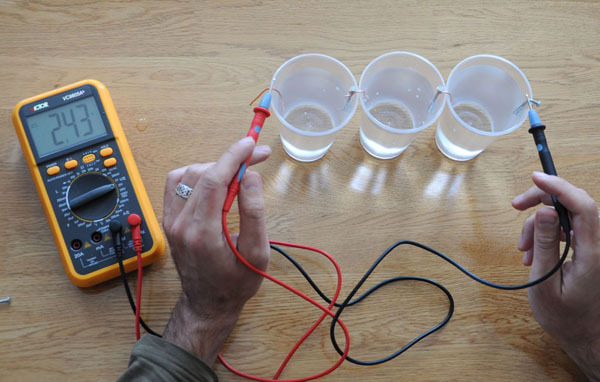 Does shape of electrode affect the voltage or amperage of the current? What if you use foil instead of wire? How long our batteries may produce power? Will this time be the same for potato, lemon and salty water?